Buenos Bergen Tango Weekend med Sabrina og Ruben Veliz! PRIVATTIMER; Sabrina og Ruben kommer 3. juni og blir til 12. juni. I denne perioden vil det være mulig å ta privattimer. Det vil bli lagt ut et skjema for booking av timer i begynnelsen av mai. NB: Begrenset antall timer pr danser/par. 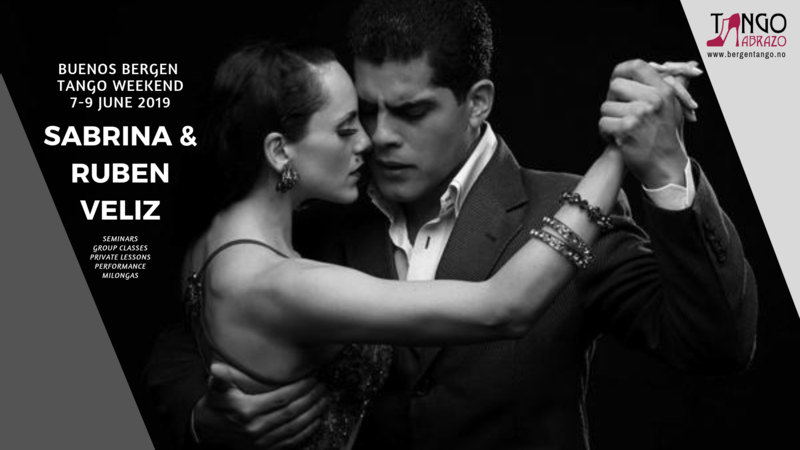 SABRINA AND RUBEN VELIZ from Buenos Aires is one of the world’s most famous tango couples. For years they have been working with choreography and film recordings and been traveling around the world as instructors. Ruben also wrote the book «Secrets of the embrace,» which deals with the technique they have developed for learning tango. They are popular as tango instructors at major tango festivals around the world – and very soon we’re fortunate to have them back in Bergen. Program will be announced soon.